Take advantage of the fast, efficient and competitive USE 33 decalcifying automate with its unique ultrasonic technology! The unique technology of the ultrasonic decalcifying automae USE 33 offers the rapid destruction of crystalline structures like calcium phosphate, magnesium phosphate and calcium carbonate. In combination with adequate solutions it provides maximum cell tissue preservation. All diffusion processes are significantly accelerated by the USE 33. The advantage: decalcification, fication and intermediate rising solutions work much faster. Benchmark: save up to 75% decalcification time for bone marrow biopsies and cartilage of nose and ear and up to 40 to 60% for corticalis tissue. 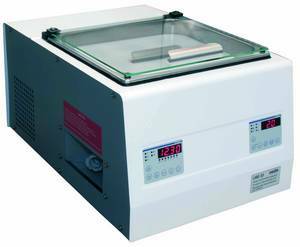 The addiotional feature of cooling the tissue samples at a temperature of +17 °C avoids the warming up of the specimens resulting from the chemical reaction with the decalcifying solution. This guarantees 100% preservation of the morphological structures and the antigenity of the samples. There are no artefacts from shrinking or swelling and all consecutive histological and immuno-histochemical methods can be applied to these samples. Medite® provides, as accessories for the USE 33, multiple sample container inserts. Depending on the sample size the user can choose from inserts including 4, 9 or 49 sample containers with different volumes. In every batch up to 49 sample containers, able to carry multiple samples, can be processed simultaneously. We also recommend our chemicals for the perfect use of our USE 33. Carefully matched components in these solutions enable the best possible decalcifying results.